Top Line: Since 1956, tens of thousands of eyecare professionals have come to rely on Hilco for smart solutions to common business problems, and for innovative products and programs that promote business growth. The eyewear and eyecare company’s extensive product range—more than 20,000 strong—and its focus on innovation, service, and value have strengthened its market position. The company has strong market positions in professional and consumer eyewear accessories; protective eyewear—Rx Sun, Rx Sports and Rx industrial safety; and eyecare products. Hilco’s Leader brand Rx sunglass line is one of its fastest growing categories. Top Line: For 40 years, Santinelli International has advocated that ECPs need a top-performing In-Office Finishing lab in order to succeed long-term. Their on-going commitment to quality, innovative technology, technical expertise and unmatched customer service, have earned them a leadership position to be proud of. Top Line: Coburn Technologies continues a long tradition as a leading provider of optical lens processing systems. Coburn manufactures and services equipment, software and supplies used in surfacing prescriptions in lens blanks, coating lenses, and machining lenses to fit patient frames. The Coburn generator family produce conventional, digital, and free-form lenses for small to mid-size laboratories. Their Cobalt generator utilizes mist-cut technology to achieve an even finer lens cut then was previously available. All Coburn generators offer the accuracy of patented single-point technology as well as eliminating the need for expensive water reclaiming filtration systems. Top Line: Hilco’s extensive product range—more than 20,000 products—includes a large selection of bench tools. The product range includes pliers, screwdrivers, wrenches, drills/taps, tweezers and files. The company also offers fashion eyewear, low vision products and lens cleaning products. Hilco’s focus on innovation, service, and value have strengthened its market position. Top Line: Carl Zeiss Meditec offers a comprehensive portfolio of products and services that enable eyecare professionals to meet the demands of an increasingly challenging healthcare environment. The company develops leading-edge technology to assist in the diagnosis, treatment, follow-up and management of the most common eye diseases, and provides comprehensive connectivity solutions to help increase efficiency and productivity with electronic workflow. The company offers clinical applications training and a broad range of service and support options. All with the goal of helping its customers overcome their day-to-day challenges so they can focus on delivering the best possible patient care. 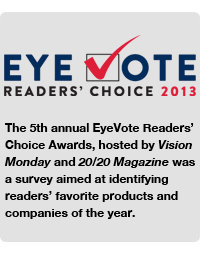 Top Line: Favorite Practice Management Solutions Company: Eyefinity. Serving the practice management needs of more than 28,000 eyecare professionals, Eyefinity is the leading integrated business management partner. OfficeMate, ExamWRITER, and AcuityLogic are the most widely-used practice management and electronic medical records software products in the industry and Eyefinity's powerful online business solutions and professional training and consulting services streamline everyday processes that help ECPs increase revenue and enhance patient care. Top Line: VisionWeb is the industry’s leading provider of software and technology services designed to streamline and simplify the eyecare industry. Through their online ophthalmic product ordering and electronic claim filing services, VisionWeb’s technology helps eyecare practices drive out inefficiency, increase customer satisfaction, and improve their bottom line.